Stitch's Great Escape's timeline takes place before the movie "Lilo and Stitch". Stitch is discovered by the Galactic Federation when he is causing trouble as Experiment 626. There are two preshows that take place. In the first, the guests are recruited to be security watching the prisoner Stitch. In the second preshow, you're given your instructions. Suddenly, Experiment 626 arrives and you're taken into the theater for the rest of the show. During the show, a lot of effects such as water, smell and sound are used as Stitch creates havoc in the theater. This show can be scary for kids. It gets very dark in the theater and kids may be frightened of some of the sensory effects used. 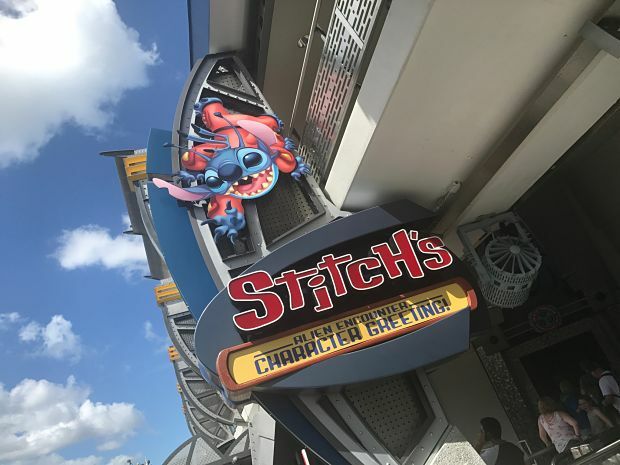 This attraction operates seasonally, and when it is closed the queue is used as Stitch’s Alien Encounter Character Greeting. Here guests can meet and take their picture with Stitch. This meet-and-greet location first occurred in the Magic Kingdom on October 8, 2017. Handicapped Accessibility: Guests in an ECV must transfer to the seats or use a regular wheelchair for this attraction. For guests requiring assistance with hearing, assistive listening devices to amplify the sound are available from Guest Services. Some video captioning is available also. Tip: A harness restraint comes down over your shoulders in this attraction and may affect people who are claustrophobic.